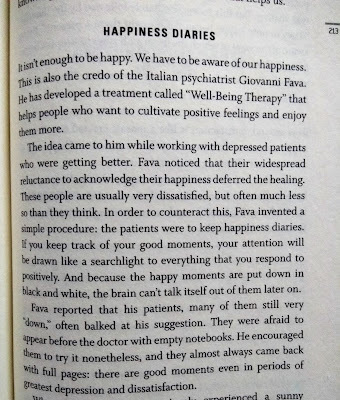 I just completed reading The Science of Happiness by Stefan Klein and first chapter into the book I decided that this needs to be stuff of common knowledge. We spend our whole lives seeking happiness. Almost everything we do is to attain a sense of satisfaction and joy. No one ever wants to be sad. 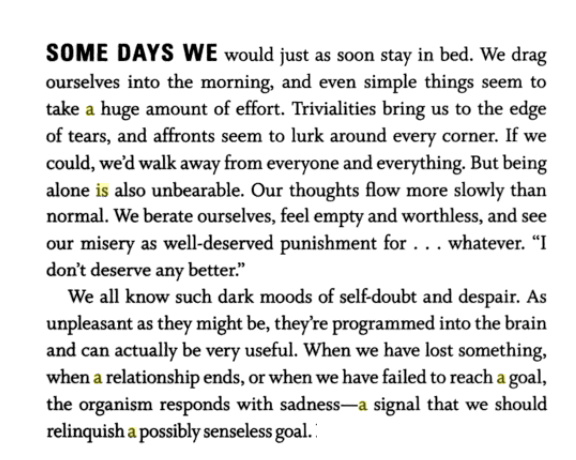 Yet we put dismal amount of effort to actually be happy. We keep expecting good things to happen to us without realizing that “good” is objective and happiness is more a state-of-mind than a state-of-life. 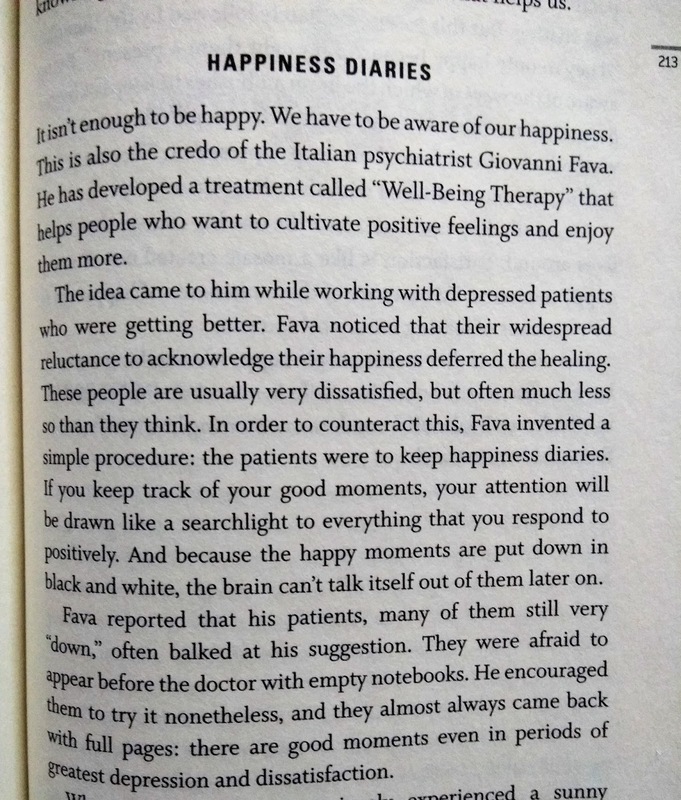 This book puts forward the neuroscience behind many of our concepts about happiness, sadness, satisfaction, love and desire. Translating everything into layman language I am going to interpret some general concepts about happiness that many of you might already know to be too ingrained in our minds that we forget the logical background of these, taking them for granted and preventing ourselves to actually follow them in our daily lives. We have a happiness system. 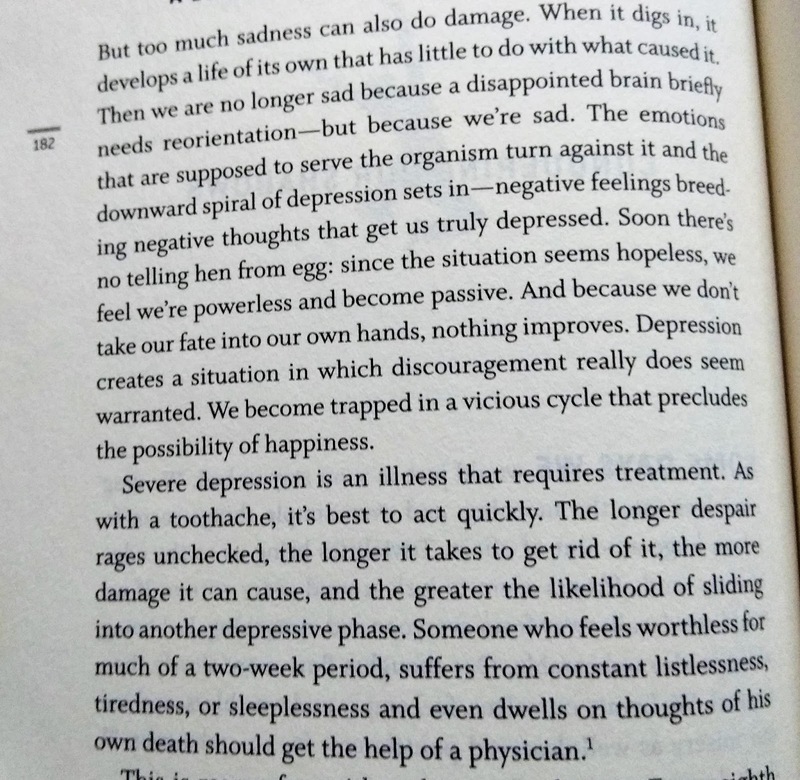 This means that happiness is not simply the absence of sadness, but it is something to be practiced despite the continuous struggles of life. Adult brain continues to change. Every time we gain new experiences, like reading a book, indulging in a hobby or going on a trip, new connections are forged in our network of nerve cells. What this implies is that no one is born a “Sunday’s child”, we can all learn to channel our energy. Connections in our brain determine how we feel and they are more easily formed in childhood. Genes too affect our ability to be happy, but only as much as destiny affects our life. WE CAN CHANGE IT. Since environment shapes an organism, brain can reprogram itself. In order to control our feelings, we must first be aware of them. We feel a lot of emotions without analyzing the why or how of it. It is same as saying you have to accept your weaknesses to conquer it. Emotions are unconscious and beyond our control, but feelings, the realization of these emotions, can well be manipulated. But manipulating the brain is quite a task. The “All Is Well” theory actually works, but it takes skill and continued monitoring of emotions to deceive the master. Human beings don’t understand reason, they understand feelings. How many times have you taken a decision impulsively somehow knowing it is harmful? It is thus important to know the root of all our feelings and then reason with ourselves. Positive feelings can extinguish negative ones and vice-versa. However, they sometimes occur together. In such times we have to choose which side we allow to take over. The feedback system of pleasure and stress are connected. The expectation of pleasure can work in direct opposition to the things that are upsetting us. If you’re having a bad day at college, the pretext of going home and watching your favorite TV show can lighten up your mood. We can use this to our benefit in a lot of situations. Rewarding yourself with a cupcake after two hours of study can increase your productivity. Little joys that don’t usually matter a lot can still get the expectation system working and help ooze stress. 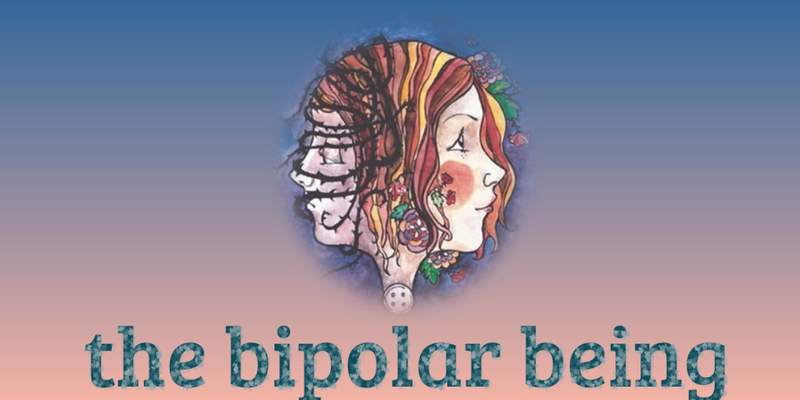 There are specific areas in the brain that control negative and positive emotions, thus reinforcing the idea that both can occur at the same time. When we control our negative feelings we increase the activity on the left side of our brain that is responsible for positive emotions. This sets a chain reaction in motion and we eventually learn to harbor positivity and shun negativity. Slowly, happiness can become a habit. But if we keep indulging in self-doubt and negativity, sadness can also become a habit. Having focus can help us practice control over almost all our habits. For example, if you have a bad direction sense, paying attention only to the routes instead of the song playing in your car or the argument breaking out next to it, will help you memorize the routes slowly but definitely. 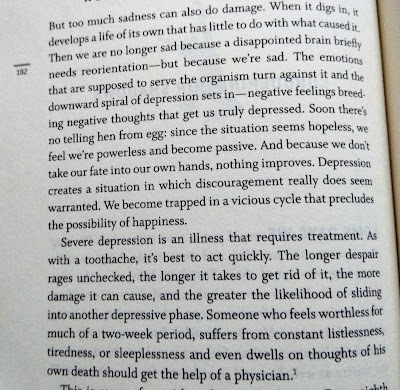 Similarly, when we focus on pain, the changes in the cerebral cortex make us still more sensitive to suffering. The perception of pain is atleast partially learned. In nature they are all good and we only have to avoid misuse and excess. That can happen only by becoming familiar. Animals experience emotions just like human beings but we have the added skill set required to resist our emotions and desires whether due to family pressure or just so that we can focus our time on our careers. Human beings are never satisfied. What we want only makes us more hungry. There is an expectation system mechanism which releases excitement at the sight of something we want. However when this process is repeated over a certain time span, the expectation system gets used to the object and we want more of it or something else apart from it. Stronger stimulation is then required to activate the expectation system. 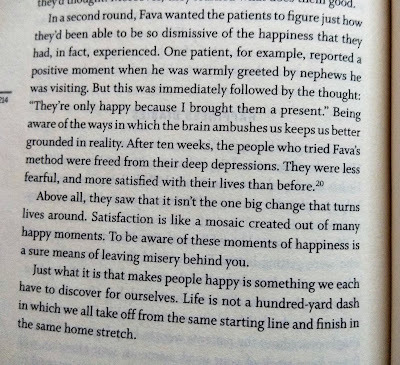 This explains the theory that happiness and satisfaction are two very different but correlated terms. 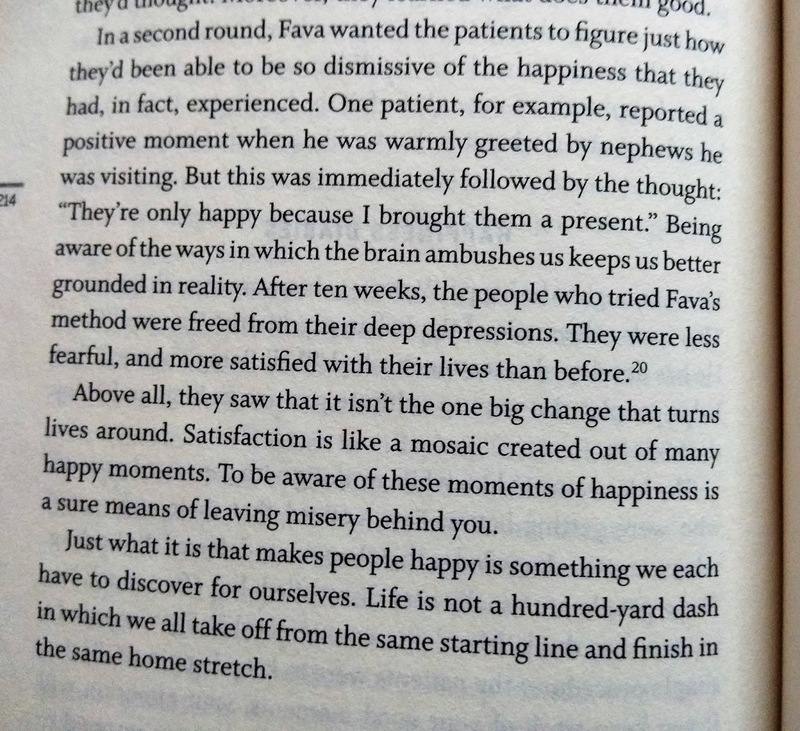 It is possible to be happy yet unsatisfied and vice-versa. There is a Robinson Crusoe theory, wherein writing down the good and bad things in our life side by side makes us realize that it could have been worse, that it is better to hold on to what we have and try to be satisfied. These are all concepts and techniques to tame the mind. However, happiness is different for all of us. Learning the science behind it can give us a better perspective but we still need to work towards it. "There are 6 billion people on earth, and there are 6 billion paths to happiness"
Trying to understand human emotions is like watching people on a Columbus. They look like a crazy bunch screaming on the top of their voices but it's only when you sit there yourself that you truly comprehend what it feels like to lose control of yourself and the screams are no longer singular beats of crazy excitement. They are reverberation of fear, uncertainty, ecstacy, energy, dizziness and the pathetic dedication to hold on, to be brave. When you sit for more rounds the ratio of fear over joy (for loss of more diverse terms) keeps diminishing. In human life too all the “firsts” are a lot more scary, a lot more painful and definitely more regretful than the “nexts”. This thought makes me look at the concept of enlightenment in a whole new light (pun intended). Gautam Budha perhaps achieved enlightenment when his ratio of joy over fear was infinity. Most of us never dare sit on the Columbus again. A person like me would never achieve that stage where the sky kissing my face would make me “one with myself” and so for people like me the ratios of life will always only change marginally; never drastically enough to be guided out of this labyrinth. At the center of this labyrinth is love. From here you might find the right way out or you might fall deeper and deeper back into the shadows. Who knows if you’ll ever get rescued then? It all depends on the people you love. Some will leave you to figure out your fate on your own. Some will hold your hand, unafraid of toil and suffering for as long as you promise them your own self. But what if you are too deeply lost to promise anybody anything that you don’t have possession of? Why are we expected to provide others the very thing we are in pursuit of? This is why I believe it is most important in life to love yourself to an extent that nobody else’s love could bend or mend you. You do need your family, friends and lovers. But the person you need the most is you. The dream is to have such power and control over your life, to be so self-sufficient that you don’t suffer anymore. And then in fact we can love more selflessly, without the baggage of getting ourselves hurt or hurting others. We can then look at people as they are, understand and accept their flaws and eventually learn to love better. Loving better for me means to put aside the pain and helplessness that is implicit in the act of loving. When you are happy and responsible for your happiness, you can carry anybody else’s sadness on your shoulders like a feather. What a wonderful, positive and desirable situation is that. Let not human relations define you. You must not define them either. Everything in life is momental. Whenever there is a sharp shift in the momental routine you can either bend yourself or be standing while the road swerves beneath your feet. Walking on requires tremendous energy and willpower. For a chicken like me it requires all that courage I always need but never muster. To see with your own eyes your life crumbling into pieces ahead of the path and still going on with it is not meant for the weak hearted. The point of this post is not to emphasize that being strong is difficult, but to emphasize that it sometimes is not in your hands. I just want to let everyone reading this know that if you’re weak right now, I too am. We all are sometimes. Knowing that is somehow cathartic. Thus I realize one more thing about human life. Collective grief helps soothe individual grief. 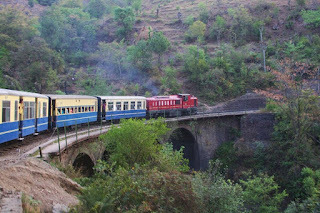 When you spend all the summer vacations of your life in Himachal, staying away from the hills for more than two years changes a lot of thing (and change happens faster in a state of bereftness). So when the train rushed past a blur of familiar houses I couldn’t help but notice that Scorpios and i10s had replaced Maruti 800s outside the houses that were now lined with fences; perhaps the fear of deceit has shadowed the naïve town life too. Bungalows can now be spotted in midst of fields. Shops are lined together in semi-cut hills. But these developments couldn’t alter the known but obliterated calm that embraced me the moment I set foot in the land of Gods. Men draped in shawls over their kurtas, women with the same redness on their cheeks and the familiar joy of homecoming. I had grown so accustomed to Nana ji waiting for us at the railway station and Nani welcoming us at home with tea, I almost forgot that in the years that I grew young, they had grown old too. Coping with the disappointment at his absence I drew my head outside the auto window; in insane admiration of just normal people doing mere routine stuff. When my mother had asked the driver to pull down the binds he replied in my favorite pahaadi accent that it’s not so cold at this hour in the morning. 15 mins later he, in his zipper, was very coolly humming a song I didn’t understand while I sat shivering despite my three layers of clothing. Once back home, I spent my three days’ stay without internet and in the company of people I had forgotten how much I loved. The takeaway was more than just memories and peace of mind; rather it lies in the realization that we all still have hope to de-cluster, that there are people whose lives are not so complex and that family means not only blood but brotherhood. Utopia exists, after all. Violence these days has become a tweet gone viral, with 140 characters of hatred and a hashtag of lunacy. War is not the new shirt you’ve been saving that one morning you just wake up and go “I should wear this today”. And nations are not siblings, no. If you hide each other’s toys and then go on taking revenge on each others’ most loved possessions, don’t think mom’s going to help you when you end up pulling each others’ hair and breaking nail for nail. Dad’s not going o come home with presents and put you on his shoulders. No one is going to clean up the mess when you turn the house upside down and leave it all destroyed. How easy it is to post “Modi is a coward afraid of war with Pakistan” and how painful it is to take bullets on your chest and bury your dead. For every other headline saying “Delhi on red alert against attacks” there’s a normal citizen like me terrified of doing my normal things. The thought of a family member being blown away makes every inch of my skin tremble with fear. If you call blood thirst courageous, I’d better find solace in cowardice. Of all the history I’ve mugged up in school, I don’t remember any war that has done us some good. But I do remember civilizations being wiped away and nations ripped off their social, economical and political stability due to war. True that we need a solution. True that we cannot and should not tolerate terrorism. But I am sure war is not any obvious answer.